Microsoft conducted a survey of Canadian media consumption and found that the average attention span for online readers is eight seconds, down from 12 seconds in 2010, and now shorter than that of a goldfish. Attention span was defined for the survey as “the amount of concentrated time on a task without becoming distracted.” It’s clear that if you’re going to get someone to open, read, understand, and act on your email, you’ll have to grab and hold their interest right from the start. Knowing of some general rules that apply to all emails will help you compose messages that grip readers’ attention. Here are five tips for writing more effective emails to combat ever-shrinking attention spans and ensure that you’re sending well-written, professional emails. Make your subject line specific. Your reader will decide whether to open your messaged based on the subject line, so write something that will catch their eye, or give them a strong call to action. Be specific. For example, if you are writing to ask a colleague for her opinion on a particular issue, it would be vague and possibly counterproductive to send an email with the subject line “Your opinion, please.” More effective would be “Opinion – Smith Account – Needed by Friday, May 4.” Your recipient knows what’s inside and how to prioritize their time to read and respond. Use bullet points or numbers when appropriate. By using bullet points, you’ll ensure that people skimming their emails will pay attention to the key points in your message, whereas separating text by commas can be confusing or cause your reader to miss information. Using bullet points keeps everything in an order that is easy for the reader to understand and find in any email. There’s no need to ramble on – keep it brief. Avoid abbreviations and shortcuts. You want to be concise, but an interoffice email you send to a colleague may be forwarded to others in the company, including the CEO. Write every email as if every person in your company might read it. Be clear so that anyone reading the message can understand your meaning. Follow the 24-hour rule if you are upset. Never send an email to someone while you are angry. If you can’t wait 24 hours, at least wait until you are cooled off and can review the email from a calmer perspective. While this tip doesn’t necessarily help with keeping someone’s attention, it will prevent you from sending an email you might later regret. Before sending your email, double-check it for grammar, punctuation, and spelling. Once again, your email may be going to a co-worker who is a friend, but one day it may be reviewed by someone in management, and there is no reason to give them the impression you are careless. While you can be casual in tone, you still want your message to be correct and to present you as a good communicator who pays attention to detail. Among these tips, numbers four and five are where Wordzen shines. Wordzen is a distinctive productivity tool for people who compose emails and want to have confidence that their messages are clear, concise, professional, and free of errors. Wordzen users compose their messages, or write shorthand instructions for what they want written, and send them to our professional editors who review and improve them. The user chooses whether the editor sends the message on their behalf or returns it as a draft. Wordzen also offers the option for users to voice-record their messages and have the editor rework and write the email for them. Not only does this ensure that your message is perfect — it gives you the opportunity to have someone objectively review your communication. As our editors draft and edit your messages for you, they’re also evaluating them for tone. When a message is obviously written in anger, our editors can soften the tone or offer suggestions for how to present your thoughts clearly without too much emotion. When you use Wordzen, you can be sure that the most important parts of your message will stand out to the intended recipient(s). Our editors are well-versed in the best practices for structuring content and will help you organize your thoughts so that your communication is gets the results you seek. 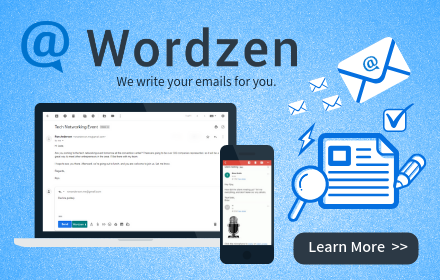 To install Wordzen and see how our editors can help you, click here. You know that sharp friend you ask to read over your really important emails? The one who not only makes sure you've crossed your t's and dotted your i's, but offers some great ideas to make you sound better than you do on your own? We provide trained editors to make sure you're putting your best foot forward -- in email.